Hemlock trees used to be some of the most common and largest trees in the North Carolina mountains. 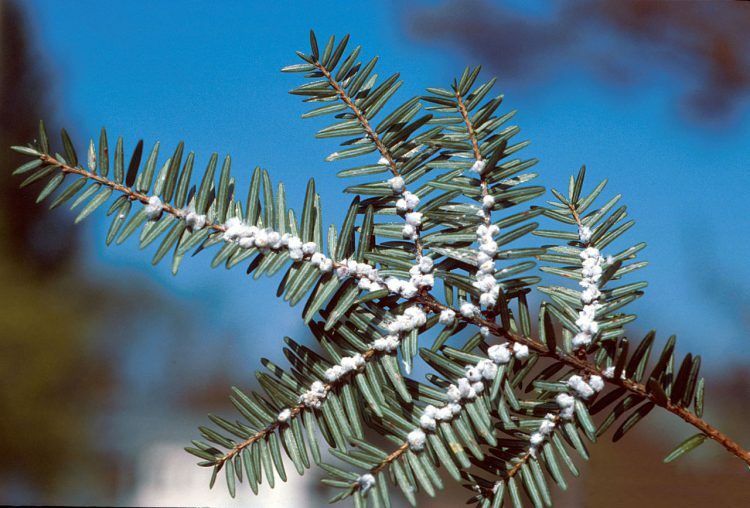 Unfortunately, the invasive hemlock woolly adelgid is threatening the continued existence of these beautiful trees. The pest is native to Asia but has been spreading throughout the east coast since it was first found in Virginia in 1950. Adelgids are small, less than 1/16th of an inch long and vary in color from dark red to purple. As the insect matures it produces a wool-like wax covering to protect itself and its eggs from predators and prevent them from drying out. This wool-like covering is the most obvious sign of infestation. The trees typically die within 4 to 10 years of infestation in the north and only 3 to 6 years in southern states. The insects are usually located near the bark towards the base of the needles. The adelgids insert their piercing-sucking mouthparts into the base of needles and removing plant fluids. Moderate infestations reduce tree health, severe infestations cause premature needle drop, dieback, and finally death of trees. The best time to manage this pest is late September through October. Registered insecticides can prove effective against overwintering females and a mid-to-late June application can reduce the number of developing nymphs. Early spring soil injections near large trees can also prove effective. DO YOU NEED CONTINUING EDUCATION TO RENEW YOUR NORTH CAROLINA APPLICATOR LICENSE? This entry was posted in Pesticide and tagged North Carolina Pesticide Renewal, North Carolina Pests.